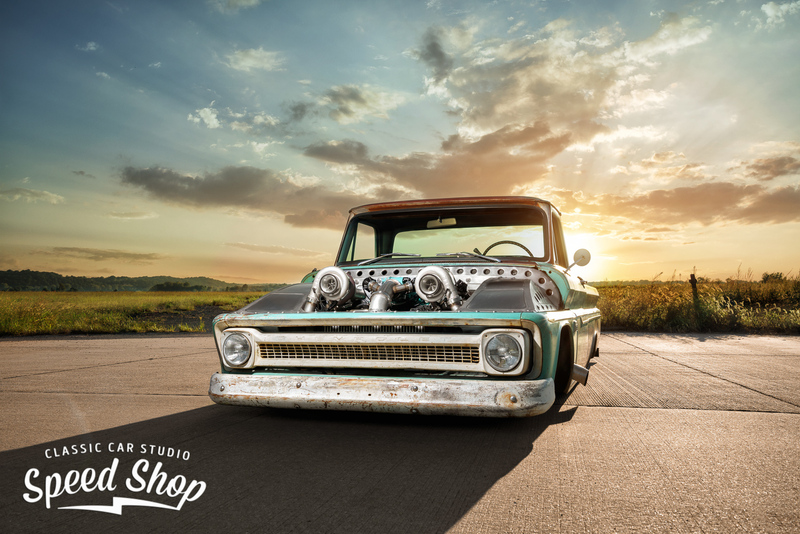 When you think of a “shop truck,” it’s likely that you’re thinking about an old workhorse that’s used for running parts and errands around town. Every so often you’ll come across a really nice one that’s used for advertising as well. 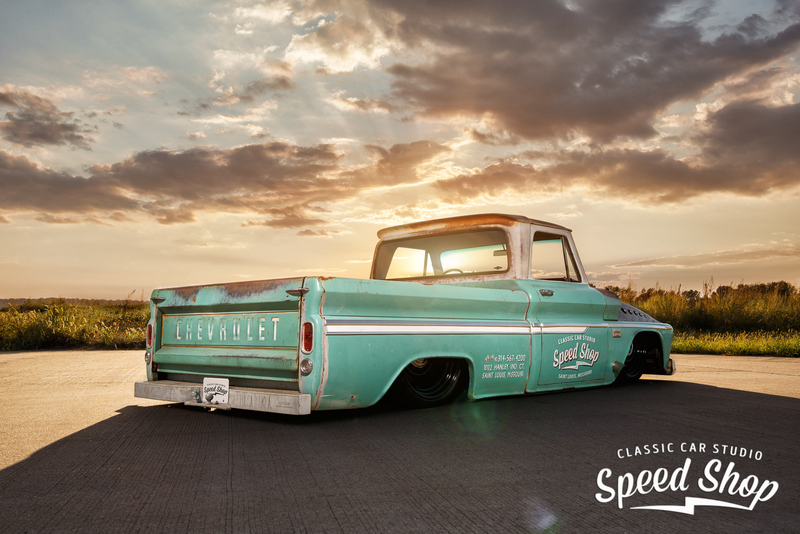 But none of which will be as nice, or badass, as this incredible C10 built by Classic Car Studio (CSS) based out of St. Louis. 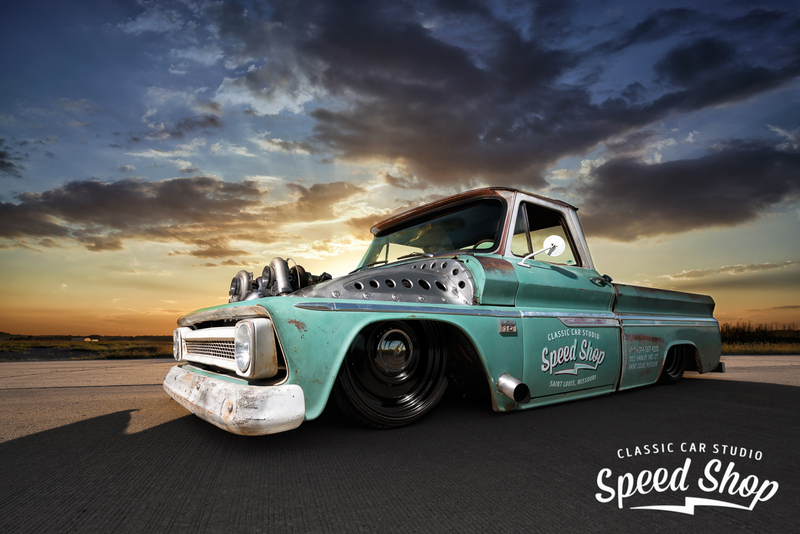 For whatever reason, they refer to it as “Tiffany,” and even with a womanly moniker, this 1966 C10 is a stunning example of what can happen when you combine a vivid imagination with an extremely talented crew of builders, mechanics, and fabricators. 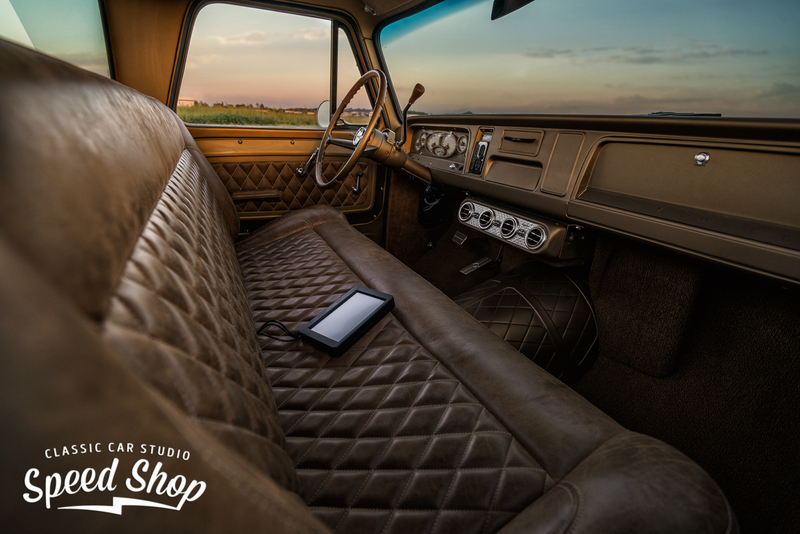 Classic Car Studio is no stranger to making high-end, magnificent machines and they have an extensive portfolio to back that up. But speaking for myself personally, I don’t think any of them hold a candle to this stunning C10 known as Tiffany. 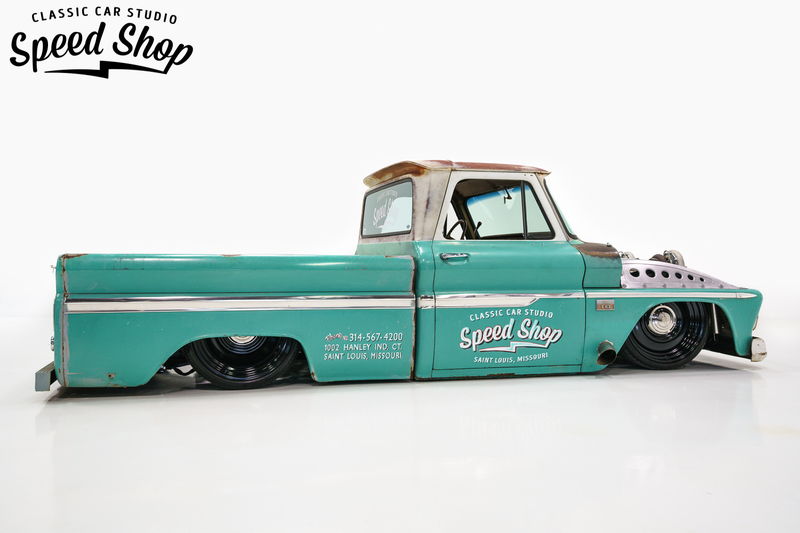 Which is impressive considering that it’s just a “shop truck,” or at least it started out being a shop truck. But as you can see, it’s so much more than that. 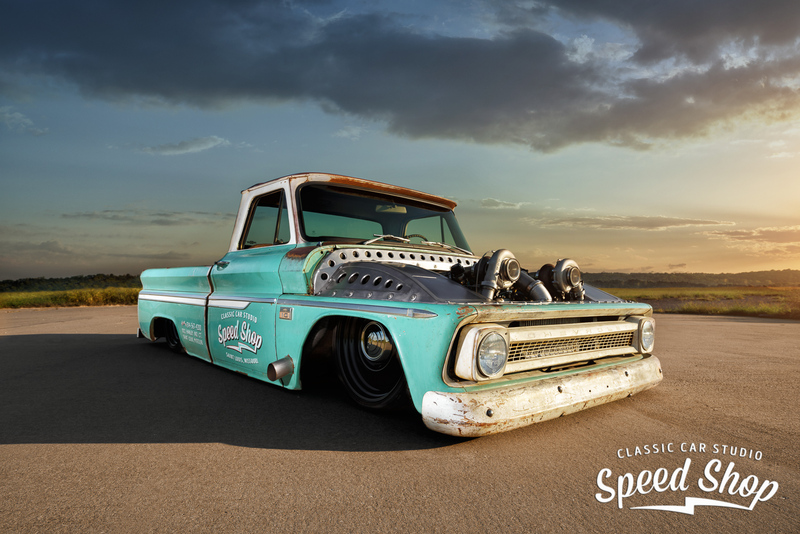 It looks more like a show quality “Rat Rod” and was even featured at the SEMA, one of the biggest and most reputable aftermarket car shows in the world. Every square inch of this truck has been meticulously designed and built to make it look like a million dollars. 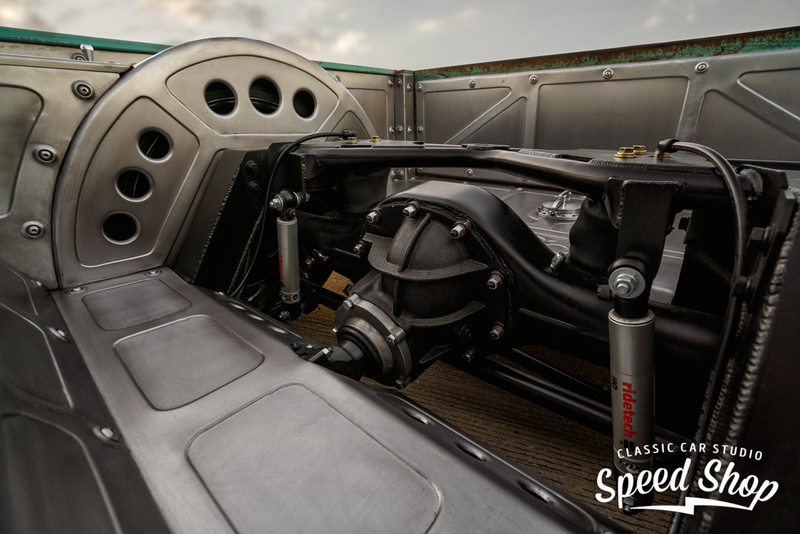 One of the most prominent features of this beautiful truck is the open air engine bay that looks just as good as the rest of the truck. Immediately you’ll notice the two massive twin turbo’s sticking up that not only provides an eye-catching aesthetic but also a whole lot of power. 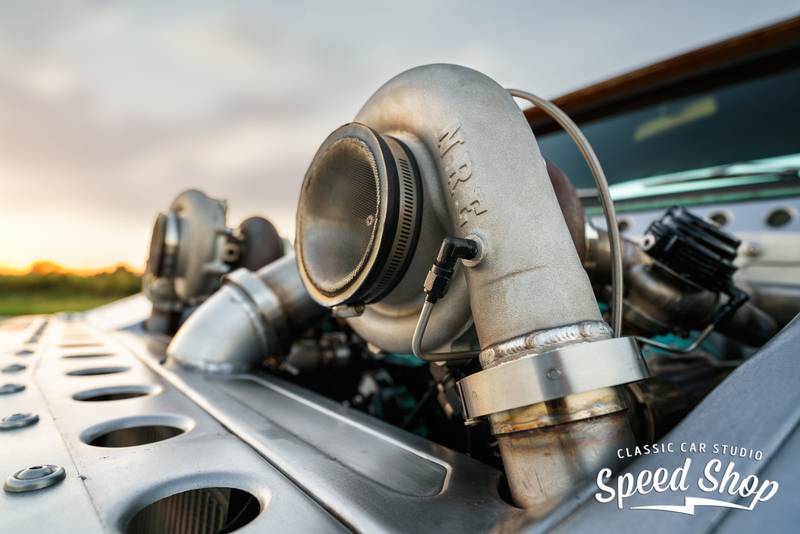 That’s because these aren’t just any turbos, they are a perfect pair of 64mm mirror-image turbos by Nelson Racing. They are said to be smooth when you want them to be, such as just putting around town picking up spare parts, or as ferocious as you want them to be when you’re out at the drag strip, or just trying to show off for your buddies. 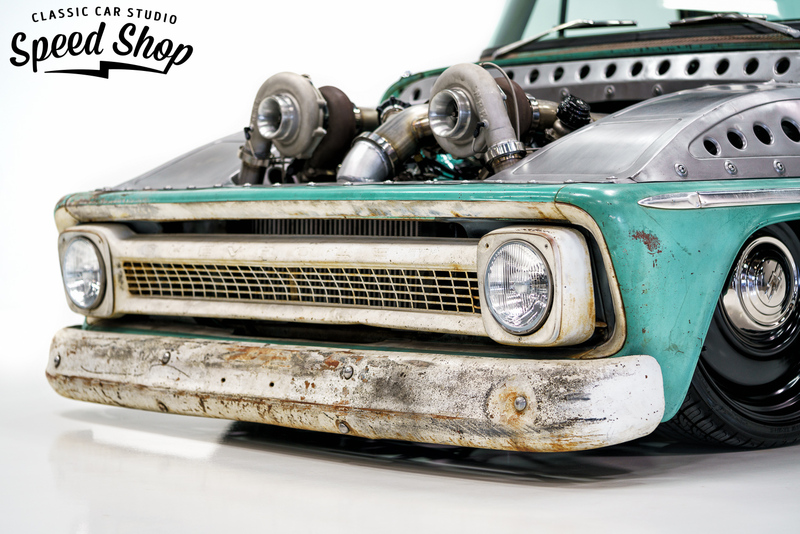 The spectacular turbo system is attached to a tried and true LS1 V8 that came from a donor Camaro and then was rebuilt with LS6 heads, billet fuel rails, new intake manifold and 105mm throttle body, as well as a Holly Dominator vehicle management system. All these amazing parts come together to create a motor that even on an extremely mild tune of just 8lbs of boost, still produces more than 750hp to the wheels. If the crew at CSS really wanted to turn it up, they could be well over the 1,000hp mark, but they wanted it to be as reliable as it is gorgeous. Plus thanks to the modern vehicle management system, Tiffany can run on E85, regular pump gas, as well as race fuel! 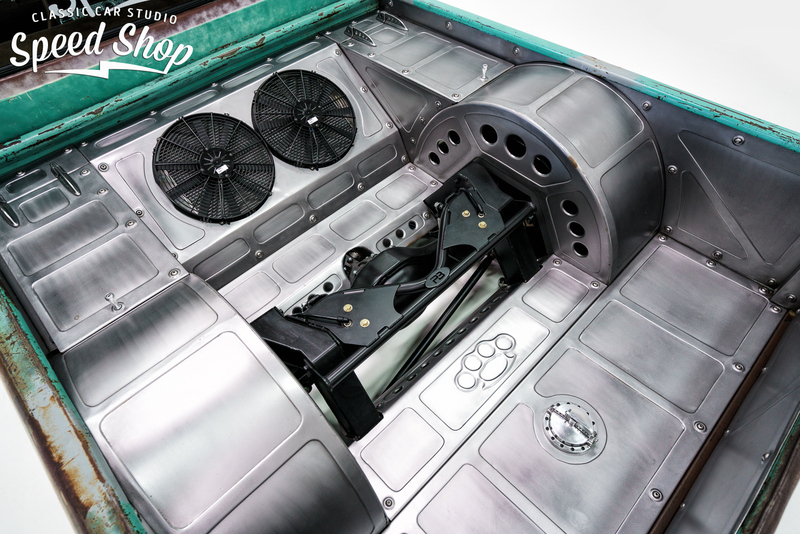 As I mentioned above, Tiffany has an open air engine bay and when you see how incredible it looks, you can see why it would be a crime against humanity to cover that masterpiece up. It can be fitted with a hood if the need arises, but we can’t imagine why you would ever want to. All the power this monster motor creates is sent to the rear wheels via an automatic transmission and Ford 9-inch rear end to help protect against snapping axles. 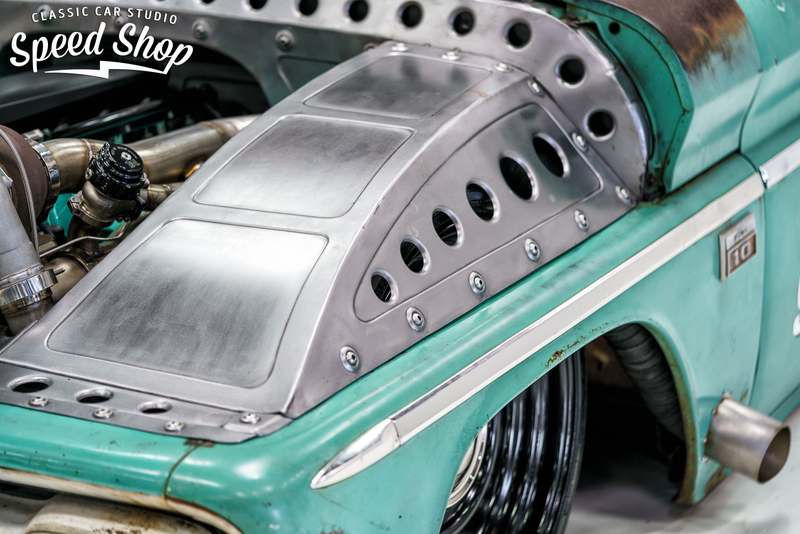 To give Tiffany that grunty, growly sound, a custom stainless steel exhaust system was fabricated. 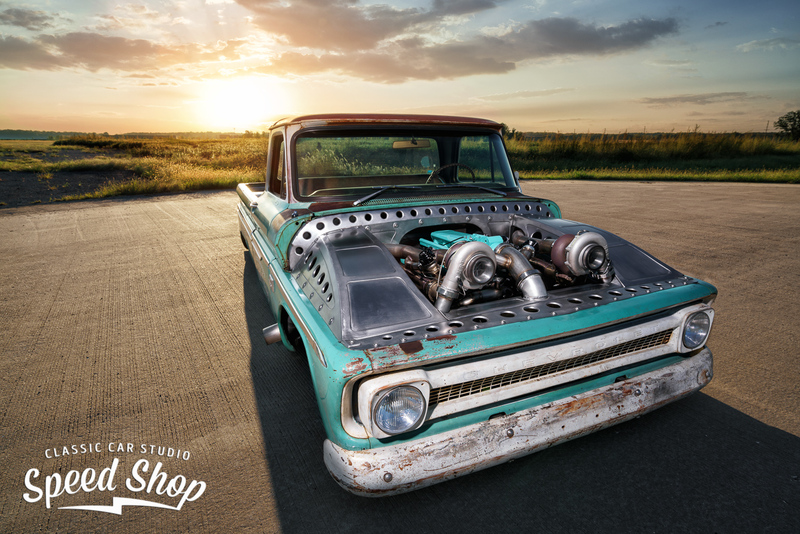 But as cool as Tiffany’s powerplant is, there’s quite a bit more to this truck. For example, the overall look and stance of the truck is thanks to a custom built air ride suspension. In order for the new system to fit, a new rear chassis had to be built, so they opted to use a Porterbuilt. Then to keep costs low, they decided to custom fabricate the entire front chassis in house. Magically the two matched up like they were meant to be together, and the end result is so low to the ground that when the bags are deflated, the truck won’t even move. The level of fabrication used in almost every aspect of the truck is second to none. 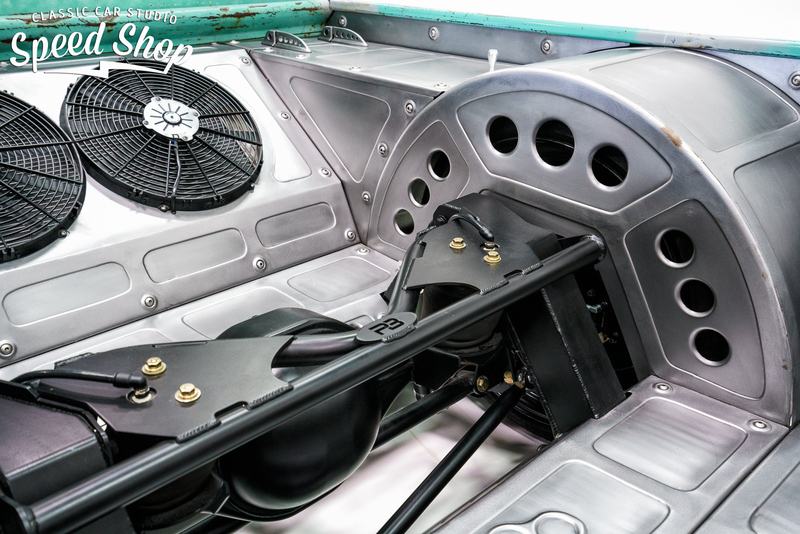 The bed had to be rethought in order to make room for the suspension components and what you’re left with is sheet metal bodywork that looks like a work of art even though it was designed to be more functional that aesthetically pleasing. 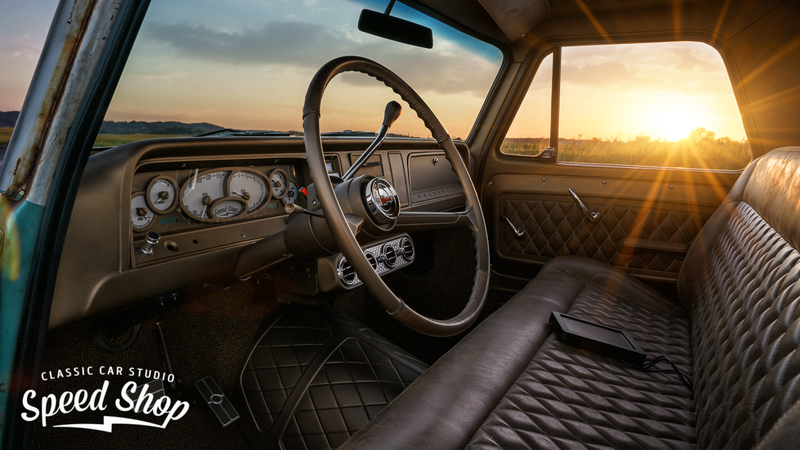 Regarding the interior, it has been created with the same level of pride and skill level as the rest of the truck. It features hand stitched leather sourced from Relicate and somehow they managed to pick a color that almost perfectly matches the exterior paint and patina. One of the sources of inspiration for the interior was a “baseball glove.” And according to reports, it even has that baseball glove smell! 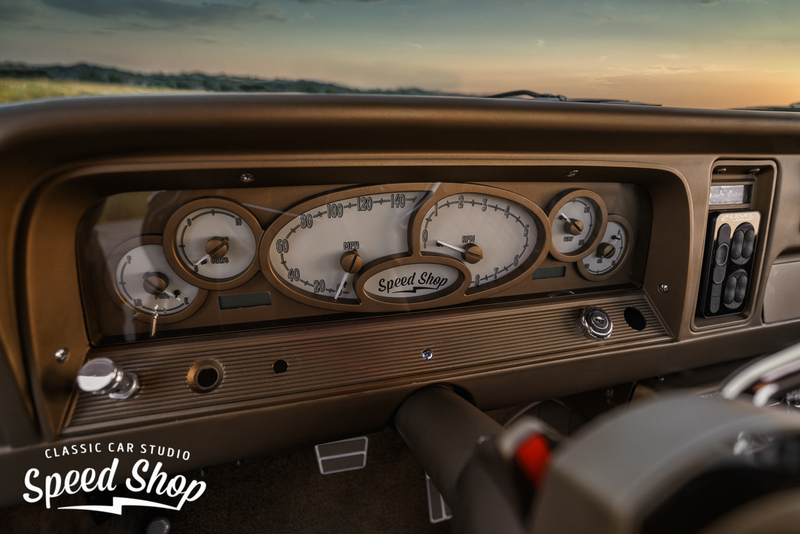 The dashboard is fitted with another custom CNC billet piece, the instrument cluster. Which had to be done in order to fit the dashboard with the necessary gauges to monitor the vitals of the potent new powerplant. In true restomod fashion, it has a fully modern Kenwood stereo system that you’d never notice, unless you happened to look under the seat, or hear it coming down the road. It even has an air condition unit from Vintage Air to make it bearable when driving around in the summer heat. 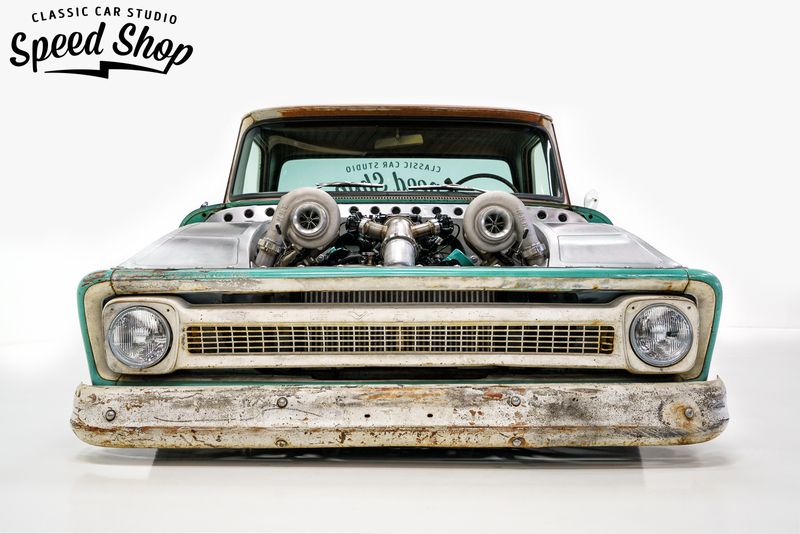 Apparently, there are more than 1,000 man hours involved in making Tiffany into what she is today, not what you would expect for a shop truck right? Which is even more impressive because according to reports, the work was done either before or after hours, or breaks during the day. And what makes it even more impressive is that every employee at CSS was able to throw their two cents in as to what the truck should look like, or features it should have. One thing that was unanimous was that the truck would not be painted. 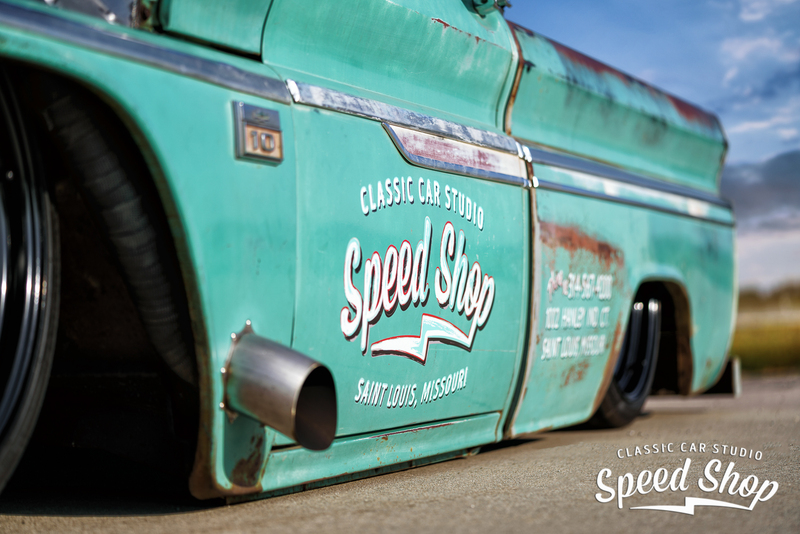 Which makes perfect sense when you see the perfect patina and baby blue existing paint color, all of which is original and untouched. 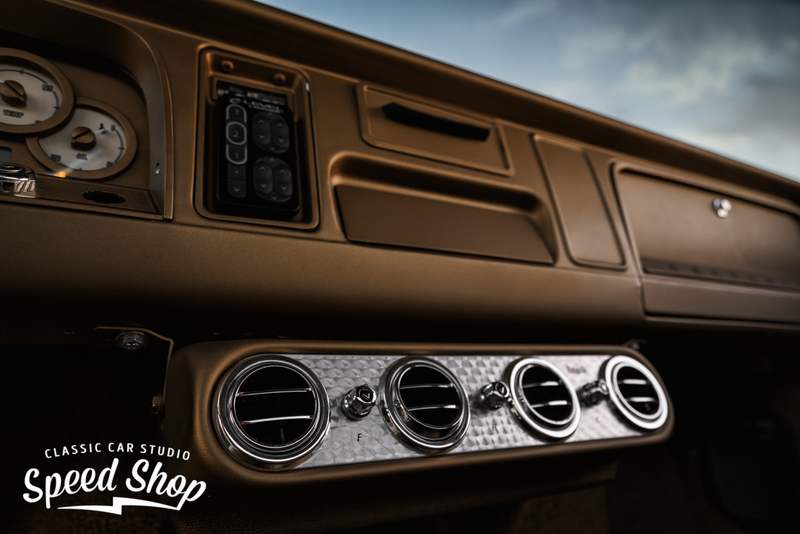 Even with a stellar reputation, Classic Car Studio has outdone themselves with Tiffany the C10. They do have a spectacular list of other projects that might be equally as cool, but there’s just something about this truck that’s so appealing to me. And even though it may not look like it at first glance, Tiffany is incredibly comfortable to drive and could be used as a daily driver if you so desired. However, I’d assume it would be somewhat terrifying to drive it out on the road, only because it’s such a nice truck. Not to mention it’s the culmination of every person in the shop’s ideas and skills. With that being said, Tiffany still makes the rounds at car shows all over the country, and can even be seen running shop errands from time to time.